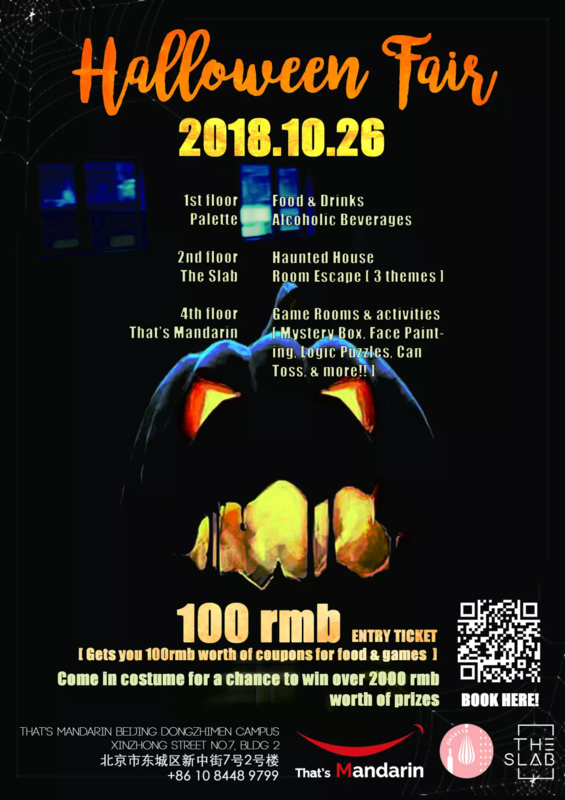 Looking for somewhere to do your trick or treat, Beijing style? Here are our suggestions for spooky Halloween parties for the family. The SLab is coming together with That’s Mandarin and Palette to bring you a Halloween Fair designed for the whole family. There will be tons of goodies and “finger foods” from Palette on the first floor, a haunted house and room escape on the second, and an array of spooky games on the fourth floor at That’s Mandarin. Click here for more information and booking your reservation. 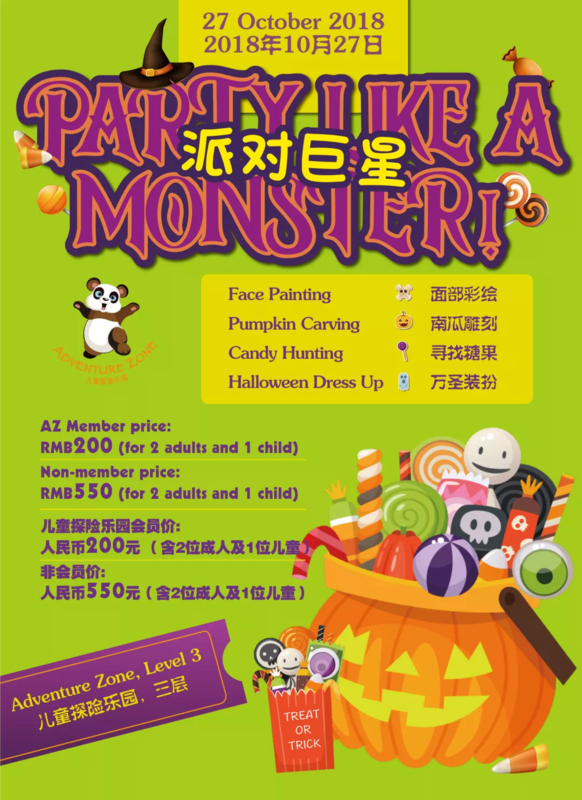 Come dressed in your spooky best to the Halloween party at Adventure Zone for tons of fun activities, including face painting, pumpkin carving, and a candy hunt. Click here for more information and reservation. Select a pumpkin and decorate or carve it. The creations will be displayed at Schoolhouse and lit up as jack-o-lanterns at the end of the day to be judged by their team. Prizes will be awarded in two groups: Children and Teens aged up to 18 and Adults. Click here for more information. Join Artplus 798 for an adventurous Halloween journey along with “witches”, “spiders”, “ghosts” and magic tricks. 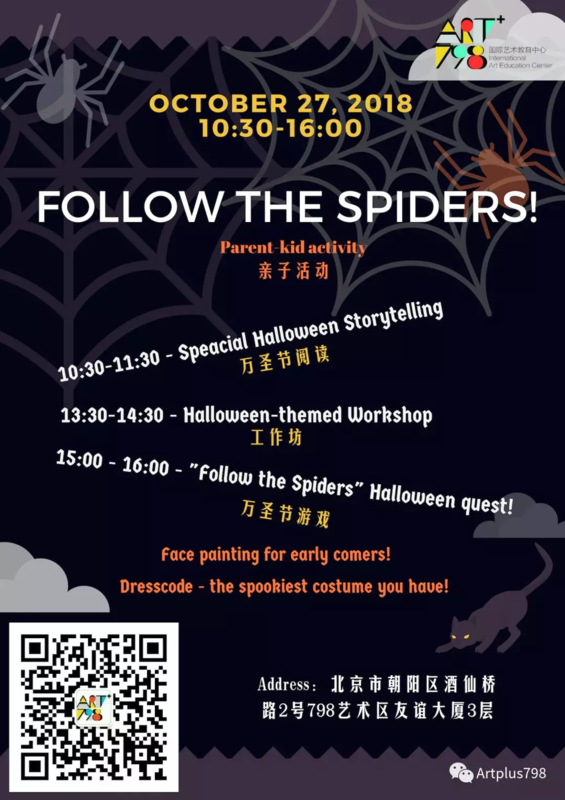 The party, with the theme of “Follow the Spiders, Trick the Witch”, will be offering various fun activities including spooky face painting and a handcraft-making workshop, as well as Halloween-themed storytelling. Click here for more information and contact WeChat 17301057981 for reservation. 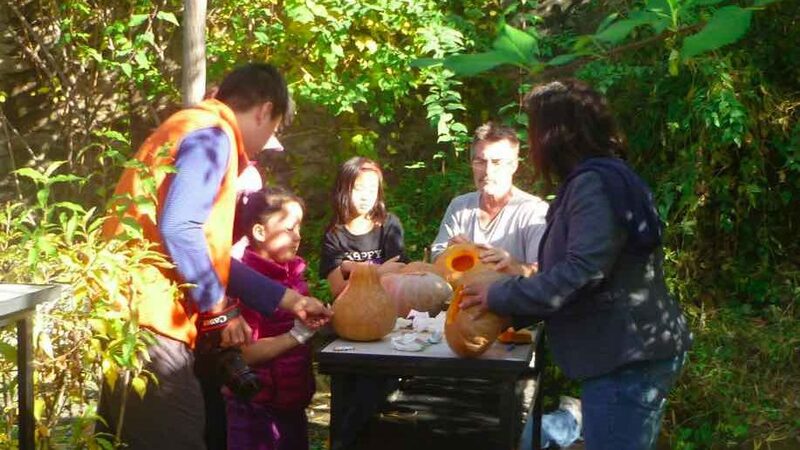 Join Slow Boat for a Halloween-themed Family Day celebration with Halloween games, fall-themed crafts, an open buffet, and a prize for best children’s costume. Adults are welcome to dress up as well — your reward is beer! 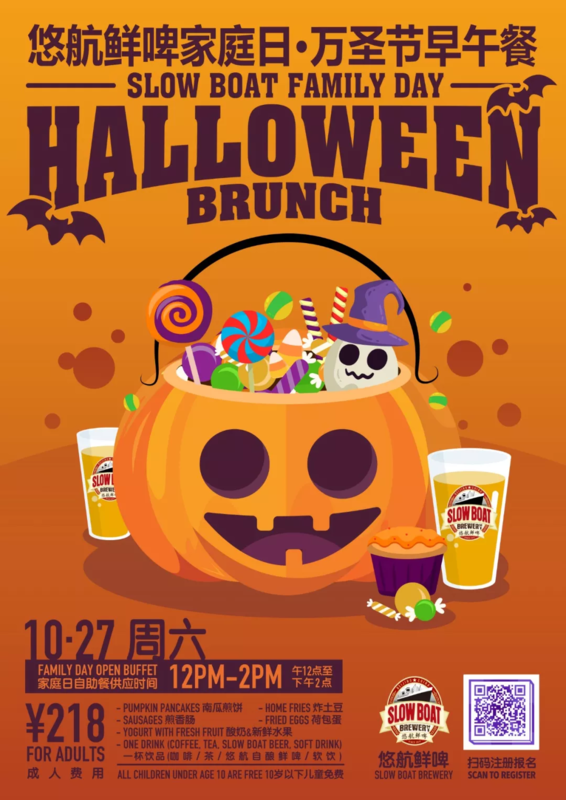 RMB 218 per adult ticket includes an open buffet of fried eggs, pumpkin pancakes, home fries, breakfast sausages, toast, and fruit salad with house-made yogurt, plus games and crafts for the little ones. Children under 10 enjoy free brunch, while adult tickets entitle you to a free beer, cider, soda or fresh juice plus the all-you-can-eat breakfast buffet. Click here to make a reservation. The Halloween full-buffet brunch returns to Feast (Food by EAST), featuring a wide range of brunch favorites and fresh seafood, with a special Halloween twist. Guests are encouraged to come dressed for the occasion wearing their spookiest outfits for a chance to win prizes in a Halloween costume contest. 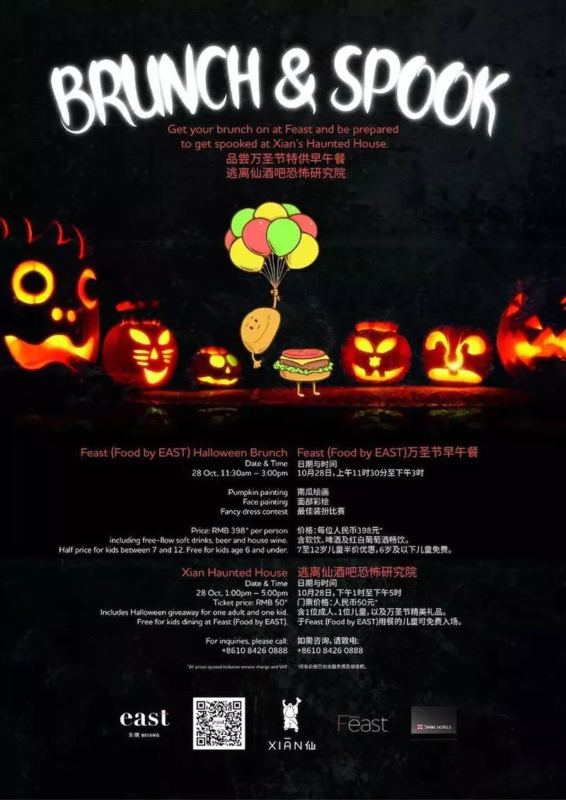 Kids dining at Feast will get free access to Xian Haunted House. Tie Family Club is hosting its annual Halloween costume party for the family. The party will be starting with a Halloween-themed movie, followed by pumpkin carving, and “trick or treat” games. Contact WeChat 13522186203 for reservations.